Just like the Energizer Bunny, he kept going and going and going. A hard-nosed two-way player, Don Marcotte first skated with the Bruins in 1965 and retired with the Bruins after the 1982 season never lacing the skates up with another NHL organization. He bled Bruins blood, never let up and did whatever it took to win games. Everybody had different jobs to do and you had to do what you had to do," said Marcotte. "I was a two-way player and would go up and down. I would go up and forecheck and come back and backcheck. That kept me going and I loved it. I had a job to do and took a lot of pride in it. It was a good bunch of guys and we had a lot of good times together. When it came time to play hockey the guys were all business and wanted to win. It was a great time." These days, it's no surprise that Marcotte, 57, is still involved with Bruins and is the Manager of the Boston Garden Club at the TD Banknorth Garden. We have just under 500 members that we take care of with tickets to the Bruins, Celtics, and events coming into the building, said Marcotte. We are open two hours before game time for dinner and cocktails. We have some good members and its fun. I live here in the winter." Marcotte resides in Amesbury, Massachusetts with his wife, Helen. The two have been married 38 years and have two daughters, Jodi, 35, and Nicole, 32 and a son, Davey, 28. They have a granddaughter, Brianna, 3 and grandson, Breadon, 2. Marcotte stills gets out on the ice and is a regular when the Boston Bruins Alumni team travels around New England creating fundraising opportunities for local communities. Throughout his career playing in the NHL, Marcotte was known for his hard-hitting and penalty killing. He currently ranks sixth all-time in games played (868), ninth is seasons played (13) and tenth in goals (230). 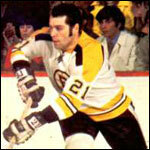 Marcotte was also a key member of two Stanley Cup Bruins teams (1969-70 and 1971-72). As far as the current lockout in the NHL, Marcotte thinks it's horrible.